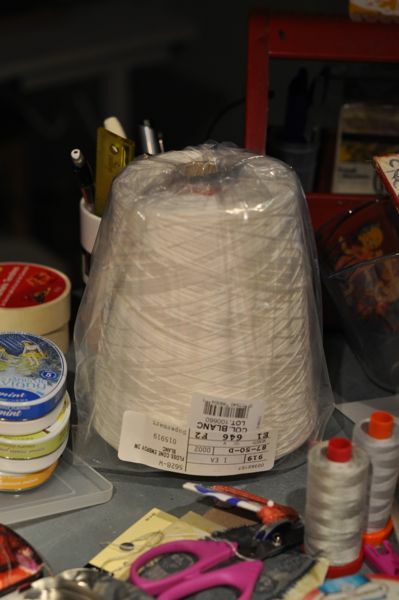 I bought this: Six Strand Embroidery Cotton, 500gm, White and I have no regret. I am falling in love with embroidery, and I mean head over heels in love. And Procion MX dye has some part in the picture. I have been having a post cancer dialog with myself as to whether I would continue to use Procion MX dye. It is a synthetic chemical. It isn’t conducive to apartment living/studio space. I still drum up projects using Procion MX dye for at least a portion of the project. I own a full set of colors and all of the equipment to go with it. So what I have decided is, I am going to use the dyes I own and I am going to use it sporadically, as I see fit. Embroidery is my current obsession and I want a full array of color gradations in every color of thread, so I prepare to dye them. I am on a mission to use the cloth I have been making for the last 10 years. Some dye use here and there, if tidy, succinct, and abbreviated is OK.
David and I walked through Red Hook this morning. There was a tag sale. I bought this set of stamps for 5$, no wait, 15$, oh, I mean 10$. It was a confusing negotiation. The cigar box had a 5$ sticker on it. I told the guy I wanted it, he said, “15$, please. You get the idea. We settled on 10$. I wanted the set. It also has a full set of numbers. 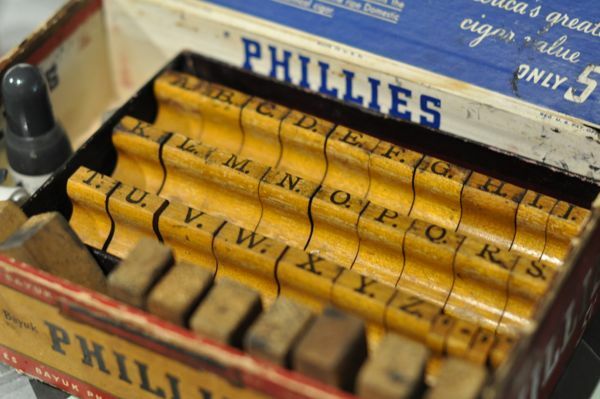 The box they are nestled in, not the cigar box is the original. We also found a brand new wash board. 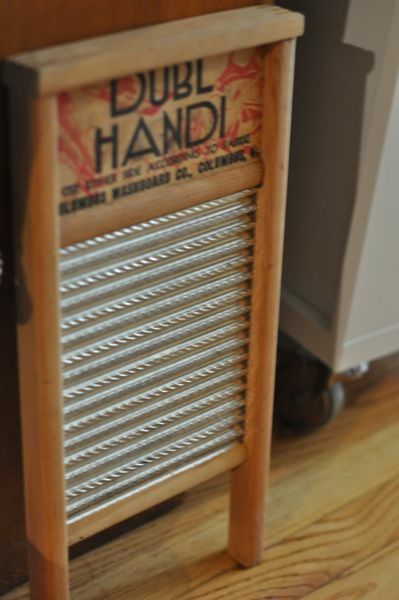 I have been wanting one, we hand wash a lot here at Casa Testa. This washing board is metal, has two textures, one flat, one grated. It really is Dubl Handi. 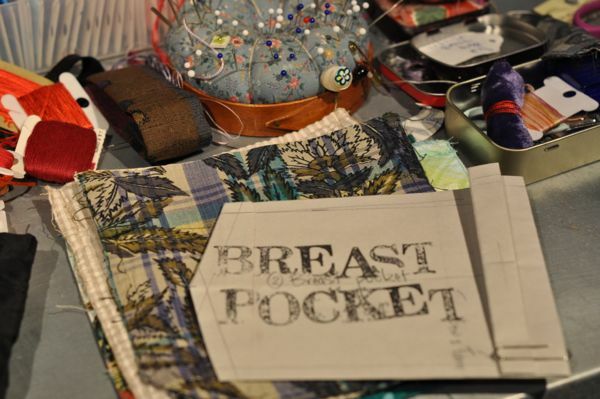 Breast Pocket production is in ull swing around the world. I have spoken to folks in Hong Kong, Australia, Finland and all over the U.S. Someone read about the project over at Craft Gossip, which I have never heard of but I like very much. Great name, too. Here you see the western pocket. I will Kantha Stitch this piece, dense straight rows in the negative space around the ribbon. Can you see it in this picture? For no particular reason, I am stitching this pocket for my paternal Grandmother. Maybe it is because she used to enjoy watching Westerns on Sunday afternoon television. I love the Kantha Cloth that uses stitch along with pictorial story telling. I will be researching more about Kantha. Previous Post: « Sewing, Stitching, Embroidery. My admiration for your efforts with the World Wide Community with the Breast Poxkets just grows and grow…and what stunning finds in Redhook….I love Redhook anyway—what are the hours and directions to that market? If it’s not too much trouble would you email me? Also…I have sent a link to your site to a friend for her sister who just underwent a double mastectomy and I want to send her the article you wrote about not having reconstructive…but I can’t find it, sooooo, again, if not too much, kindly include the URL for that. I did an historical study of Kantha embroidery in a Level 2 class I took at the Gail Harker Center for Creative Arts and completely loved it. We each had to do our own narrrative–I chose the garden since that is my other love. 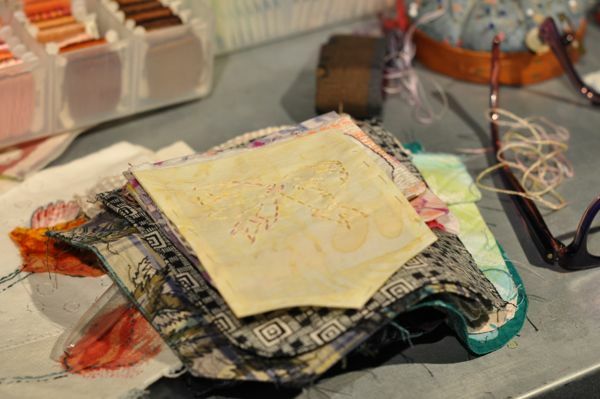 Love how the running stitch can actually create movement in the story-telling of the piece. OH I love letter stamps! Those are amazing and a great buy too!